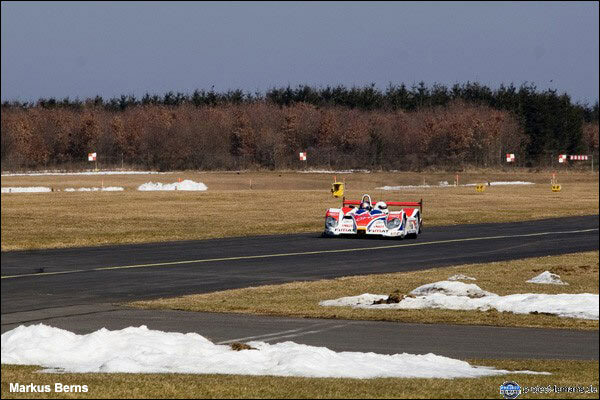 Today, March 23, the Kruse Motorsport Courage C65-Judd made its roll-out at the Dahlemer Binz Airfield, near the Nuerburgring. 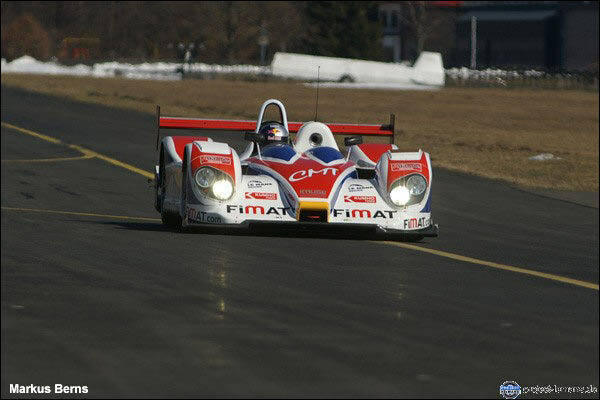 Frank Diefenbacher drove the first laps with the LMP2 prototype, along the runway in Dahlem. Both Kai Kruse and Diefenbacher were absolutely delighted with the short, shakedown session - the C65 displaying its new, but slightly familiar, 2006 livery. Initially though, the Kruse crew had to fight with the Eifel weather. Temperatures near zero and strong, cold winds didn’t make it easy to start the 3.4 litre Judd engine. “Judd doesn't allow us, to start the engine before the oil and water reach a temperature of a minimum 35 degrees, but 40 would be better,” explained Kai Kruse. It wasn’t easy trying to get the temperatures up, because a prototype has many holes in the body for cooling the engine and gearbox ….and the “Eifel-wind” was finding them all!. But after all the holes had been closed, and with the help of a gas-heater, the oil and water were warm enough to run. “Normally, we unload the truck and stick the standard heater into the car, go to breakfast and after returning the car is ready,” explains Kruse. The test driver was the 24-year old Frank Diefenbacher, who has been racing in the WTCC for the past three years. 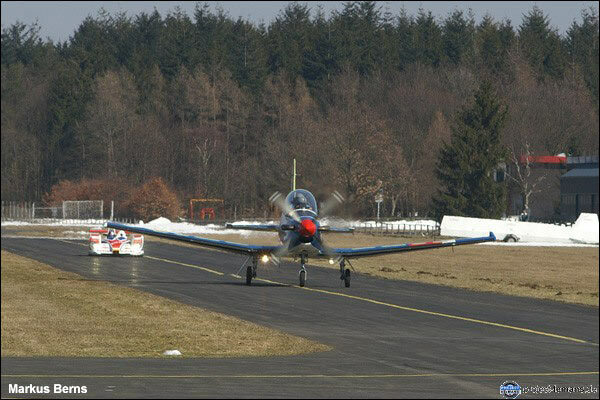 Whwether Diefenbacher will be the third pilot, alongside Jens Petersen and Jan-Dirk Lueders, is not definite at the moment, but intensive negotiations are underway. The roll-out itself was successful. “All the signals were green, I am very excited, no problems at all,” chuckled Kai Kruse. But the team did not test the complete race configuration: “We had a special test mapping on the engine. 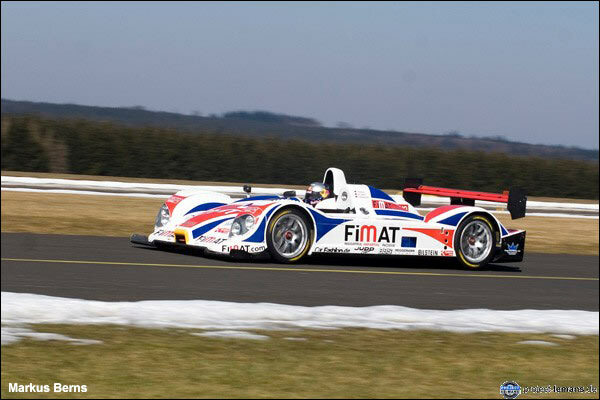 Normally, you would do 10.500 rpm with the Judd V8, but today we set a limit at 8.000 rpm.” The physical limit by the way is round about 11.000 rpm…..
For Diefenbacher this was the first outing in a sportscar/GT car since 2003, when he tested the Seat Cupra GT. “The response characteristics of the engine remind me of my Formula 3 times. 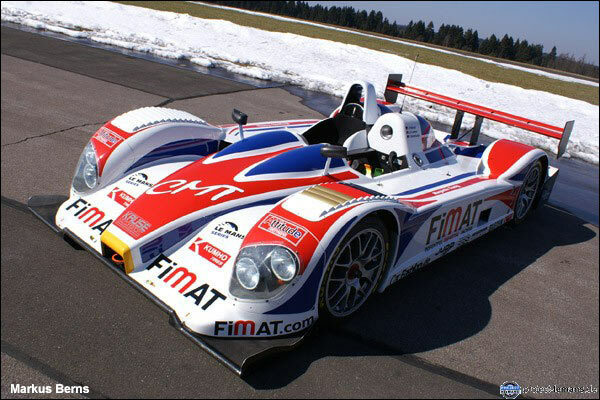 Otherwise you cannot compare a prototype with other race cars. But I was astonished, how exhausting it is, to keep the Courage straight on the road. The car follows every bump on this airfield. A more exact view is possible after the test sessions in Paul Ricard. I think I will need one or two hours in the car to be really fast.” More difficult was the fact that only rain tyres were fitted on the C65, no slick tyres. Jens Petersen and Jan-Dirk Lueders are already on their way to the south of France. The Kruse Motorsport team will follow on Friday.